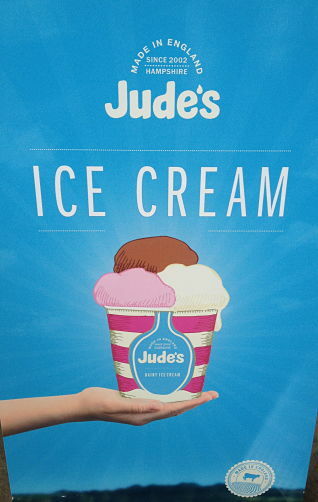 Jude’s ice cream is a small family run business, based in Hampshire, UK. 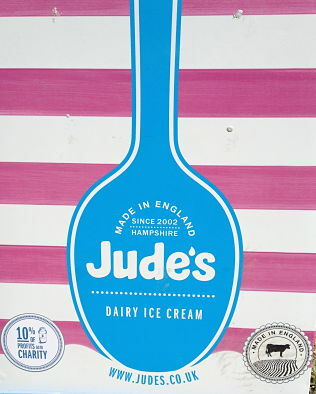 I first came across Jude’s at the Wimbledon tennis championships – I think it is a pretty good endorsement to be chosen as the supplier for the tournament and they also have several Great Taste awards. 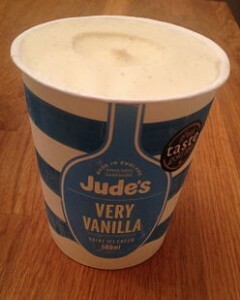 However, I did not eat the ice cream at Wimbledon as the tub had a ‘may contain’ statement on it. 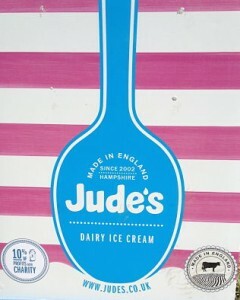 I mentioned this on my Wimbledon post, and Jude’s contacted me to say the ice cream is actually gluten free and the old packaging is in the process of being replaced. I was offered some samples to try, and I chose Vanilla (always a favourite), Salted Caramel and Dark Chocolate sorbet. Until I opened Jude’s vanilla ice cream, it had never occurred to me why you usually cannot see the vanilla beans in vanilla ice cream. 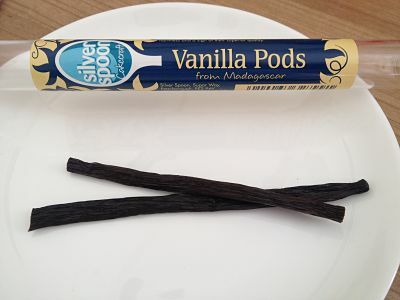 If you have never seen a vanilla pod, they are very dark brown and you can see the brown specks throughout Jude’s vanilla ice cream. You can’t really see it in an iPhone photo, but trust me, they are there. The ice cream is smooth, creamy and has just the right amount of vanilla. It easily competes with big brands on taste and won gold in the Great Taste 2010 awards. 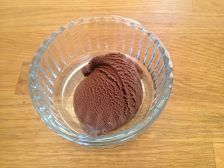 The Dark Chocolate sorbet is a revelation if you are also dairy free. It tasted just like chocolate ice cream – very creamy and melts-in-your-mouth. It is quite rich because of the dark chocolate – I like dark chocolate, so I really enjoyed the taste and it also goes very well with some raspberries. 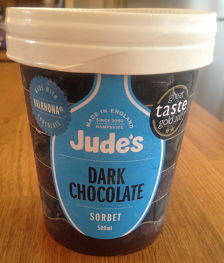 The chocolate sorbet won gold in the Great Taste 2012 awards. 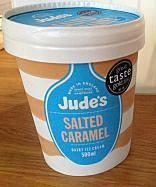 I probably never would have bought Salted Caramel ice cream, mainly because the idea of salt and caramel does not sound that appealing to me, but I know this flavour is having a bit of a resurgence in popularity, so thought I should try it. I thought it tasted very nice and not salty at all. Now that I think of it, I really like popcorn that is sweet and salty, I just never thought about it in relation to ice cream. Jude’s Salted Caramel ice cream won Gold in the 2011 Great Taste awards and two stars in the 2014 awards (it looks like the ratings have changed to a 1, 2 & 3 star system and 2 stars means “Outstanding”). 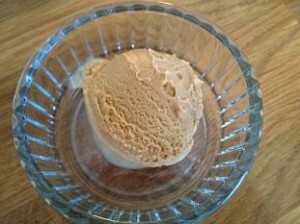 It is also rated as the best Salted Caramel ice cream in The Telegraph. Have you ever noticed how you suddenly become aware of a brand? I started seeing Jude’s everywhere over the summer – including at the Houses of Parliament public café at Westminster and Highclere Castle (of Downton Abbey fame). This awareness actually has a name – Baader-Meinhof Phenomenon or ‘frequency illusion’ – you can tell your friends that next time they buy a car and suddenly see it everywhere! You can check for stockists on their website – you will find them at London and Hampshire farm shops and deli’s, but you can also buy from Waitrose, WholeFoods Market and Ocado. I even found the little 100ml containers at my little Sainsbury’s Local. The 500 ml container is £4.69, which is only 30 pence more than the brand I would normally buy. If you would like to win some Jude’s ice cream, they have a monthly prize draw on their website. Declaration: Jude’s ice cream provided me with samples for this review.